This year I had planned to vegan sweets for diwali. 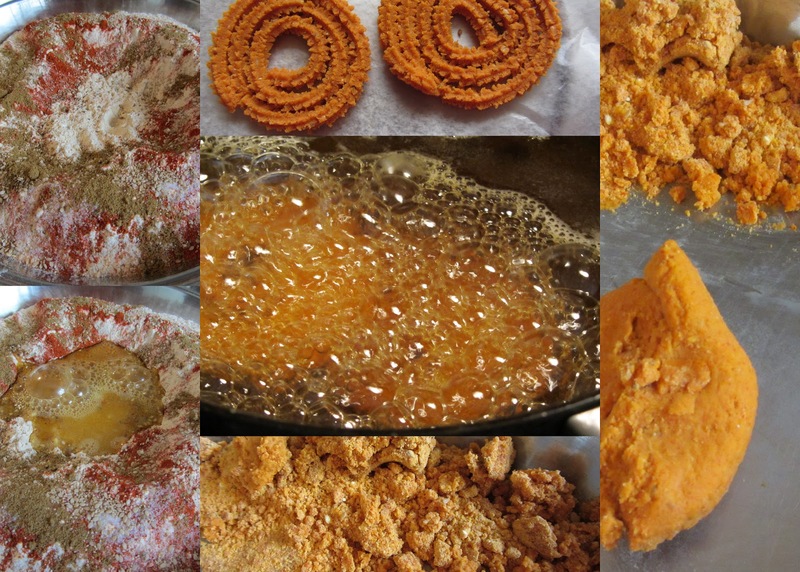 I have been making couple of things vegan for diwali for past 5-6 years. It is not difficult at all. This year's special I wanted to make more sweets and push myself to make them all vegan. I succeeded! Well almost! My husband loved Besan ladoos and I did not have time to try vegan versions before diwali so I made those for him with ghee. I will share recipes one by one soon. Another big step for me to make Chakali without my mom's supervision. I have been helping my mom make chakalis for years now. I know most of the details of her way of making these diwali special treats. I do not like deep frying so I have not made these in past 8+ years. This year my husband said he will fry them if I decide to make. But it needs bhajani. Bhajani is mixed grain and lentil flour made specially by washing, drying, roasting and grinding. Everyone has their special proportions and way of making these. I did not have any! I remembered noting down a microwave bhajani recipe from a friend. Her mom combined all the needed flours and roasted them in microwave. I decided to use her basic proportions and make little changes of my own and give it a try. It worked perfectly! As soon as my attempt was successful, another friend of mine decided to try it and it worked for her too!!! Mix all the flours from 'Flours' section in a baking dish. Start oven at 350F and bake the mixed flours for about 25-30 minutes. The oven does not have to be preheated. Remove the baking dish and let it cool down. Add all the spices and make a well in the middle of the flour. Heat 1/4 cup oil. Drop a pinch of dry flour, it should sizzle immediately. Now pour this hot oil in the well you made in the flour. cover the oil with remaining dry flour from the side and let it cool down a bit. Mix well with spoon. Now mix everything properly, adjust salt and chili powder per your taste. Pour enough oil in a pan to deep fry 2-3 chakalis at a time. With very little warm water, make the dough. It should just come together and not too soft. Now take a portion of the dough enough to fill one chakali press. Little water at a time, make it bit softer. It should NOT be as soft as chapati dough but harder. Fill chakali press, carefully make round chakalis in a plate or on parchment paper. Once the oil is hot enough lower the heat to medium carefully slide chakalis in oil. Fry 2-3 chakalis at a time till golden brown on both the sides. Repeat for remaining dough. Kolekar Kaku uses soaked and fine ground Urad dal instead of urad flour and uses that to make the dough and water if needed. You can roast flours in microwave per your judgement. If you make the dough too soft them the chakali will not look spiky enough and can get softer. Deep fry chakalis on a medium to low heat as they need to be cooked thoroughly. They look sooo good! Feel like trying them immediately... may be after we go through the ones Mom sent. Mints, you are my hero. I tried to make Chakali with bhajani once, using my Vitamix blender, but the powder was just not fine enough and I ended up with delicious little pieces of chakali rather than a whole spiral. I am not sure I get udad flour at my local Indian store, but I'm going to look and see. These are killing me. Oh, and I just noticed the tip on soaking and grinding udad dal with water-- that's something I can definitely do. Thanks! Is any thing which replace udad flour? i am in belgium not possible to get flour. Vaishali - thank you for your kind words. Madhavi, as first tip in the post says, you can use soaked and fine ground Urad dal. The chaklis were just zhakaas. The texture was just right and taste was delicious! Big hugs and thank you for these.